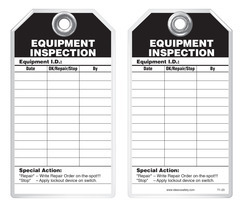 Use this tag to record regular mechanical, safety, electrical, hydraulic, and other inspections for specific equipment. Idesco Safety's Classic Industrial safety tags are uniquely durable and strong and they are the most popular lockout safety tag for thousands of industrial companies around the world! They hold up against moisture, dirt, grease, chemicals and extreme temperatures. Each tag has a 3/8 hole reinforced with a metal grommet and has a pull strength that exceeds the 50 lb pull strength established by OSHA's Lockout/Tagout standard (OSHA 1910.147). Printing is UV protected and encapsulated inside rigid PVC. This rugged material has a durable, hard-matte finish which retains pen, pencil and marker notations and pencil may be erased for multiple use. Safety tags come in standard size 3-1/8 x 5-5/8 and are also available in custom sizes and custom designs - add your company's logo, or customize your tags with special wording. Safety tags are also available in 2 alternative, economical materials shown below. Turn to Idesco Safety - America's Safety Tag leader! 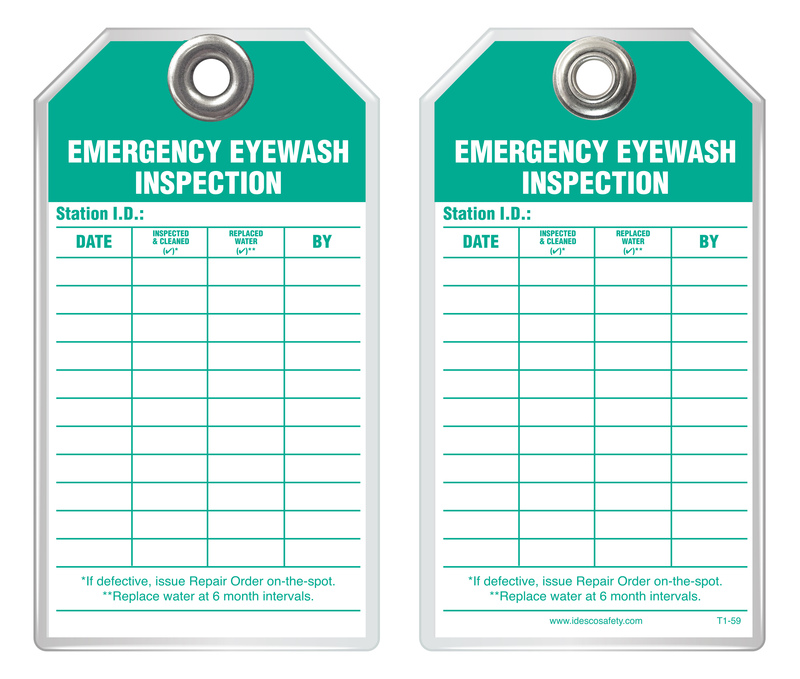 Classic Industrial (T) 3-1/8" x 5-5/8"
Sturdy Card Stock (C) 2-7/8" x 5-3/8"
All Plastic (V) 3" x 5-3/4"
Idesco Classic Industrial Safety Tags are durable and strong and withstand moisture, dirt, grease, chemicals and extreme temperatures. These tags have a 3/8" hole reinforced with a heavy metal grommet. Each tag has a pull strength that exceeds the OSHA-required 50 lbs and consists of 6 mil paper printing encapsulated inside 25 mil of rigid PVC. This rugged material is UV-resistant and has a hard matte finish which retains pen, pencil and marker notations which may be erased for multiple use. This is the safety tag of choice for industrial facilities throughout the USA. Idesco Safety’s All Plastic Safety Tag is an economical alternative to our Classic Industrial material. These light weight, all-plastic safety tags have a 3/8" hole reinforced with a metal grommet. Each tag is printed on 12.5 mil rigid PVC material which is UV-resistant and has a matte finish for pen and marker notations. These tags are best used indoors, or for limited time outside. 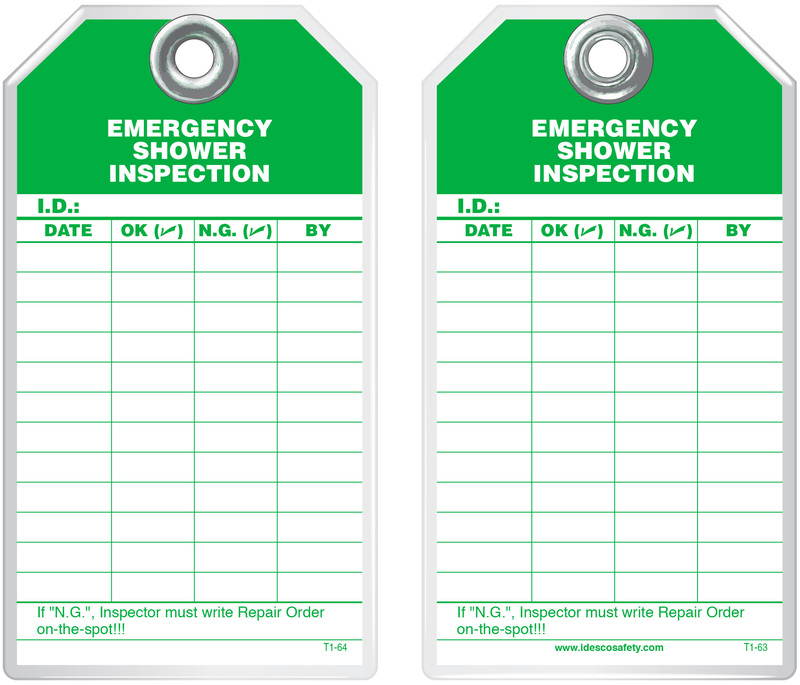 Idesco Sturdy Card Stock Safety Tags are ideal for indoor and short-term use. 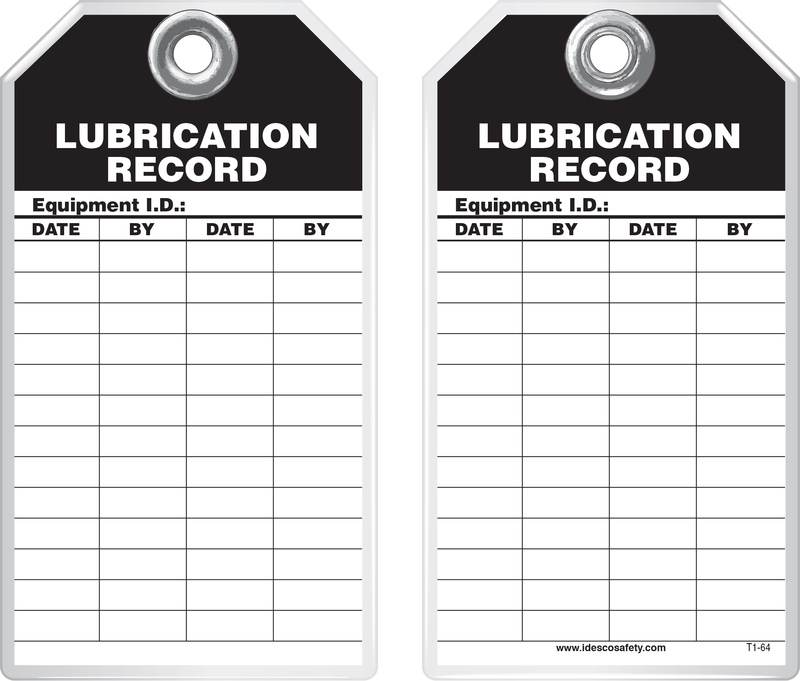 These economical tags are printed with UV resistant inks on card stock. You may also laminate these tags to make a permanent, durable tag by using Idesco Q-Tag® Laminating Pouches and an Idesco brand Desktop Laminator. 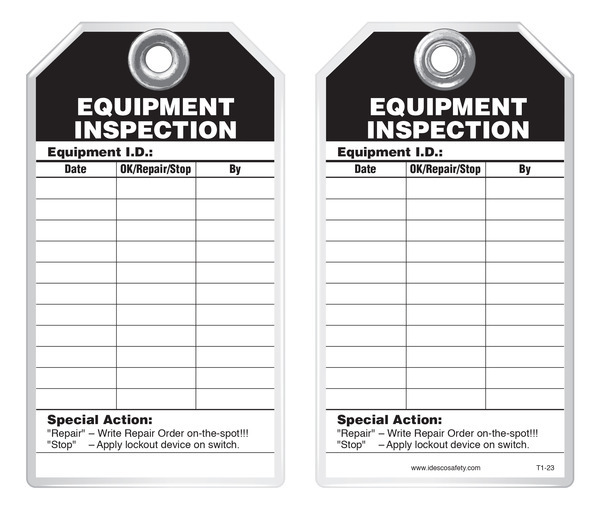 Sturdy Card Stock Safety Tags have a 3/8" hole and may be reinforced with a metal grommet. These tags do not have the 50 lb pull strength required by OSHA for lockout/tagout situations and are generally used for warning or identification purposes only.